This artpack, called "Armies of the Deep", consists of assorted troops (footsoldiers, leaders, corpses, etc. ), all rendered in a homogenous style, allowing you to depict five fantasy races: Drow, Driders, Duergar, Dwarves, and Orcs). Included are a "Ready/Idle" pose, an "In Combat" pose, and a "Dead/Prone" pose for nearly every figure (ideal for use with BRPG's token-swapping feature). All 114 figures in this 8.6 MB artpack come pre-sized and pre-rotated for use in Battlegrounds. They've all been scaled to match each other in relative size, and are all high-resolution (122 pixels per cell), so they won't pixelate even at full zoom in BRPG. The figures are suitable for a game scale of 3 feet per hex (and 5 feet per square, too, of course). Even when you don't need an army, many of these figures can be used to represent PCs or NPCs, so they should be useful in a number of games. The "Armies of the Deep" artpack costs $10 for GMs (but, like all artpacks, is free for players). It can be purchased from the [urlx=http://www.battlegroundsgames.com/store.html]BG Store[/urlx]. Half of the proceeds will go to Alynnalizza (the artist), and the other half to support continued development of BRPG. And if this artpack does well, Alynnalizza will probably create more artpacks in the future. The "Armies of the Deep" artpack makes a great companion set for the [urlx=http://battlegroundsgames.com/forums/viewtopic.php?t=2309]"Medieval Armies" artpack[/urlx] and/or the [urlx=http://battlegroundsgames.com/forums/viewtopic.php?t=2890]"Elven Armies" artpack[/urlx]. Note that players will need to have this artpack installed during sessions where the GM will use it, and everyone must be using BRPG v1.6m or higher. Below are preview images of the five races included in this pack. The first screenshot was taken at 200% zoom, so that you can see all the detail. The second screenshot was taken at 170% zoom, to fit more tokens into the preview image. Be sure to click on each image to see it at full size. Note that the Dwarves in "blue" platemail are color mods of the earth-colored Dwarves, rather than custom renders. For the past 5 years I've been running a series of completely underground campaigns in a custom D&D setting. The whole time it's been going I've been searching for more underground maps and tokens. The artpack looks like exactly what I've been needing... except that recently the characters in my campaign discovered a legendary land called "The Surface" and are now trapped there, cut off from all underground lands and creatures. Maybe this artpack should inspire me to let them find a way home! markuwp wrote: For the past 5 years I've been running a series of completely underground campaigns in a custom D&D setting. The whole time it's been going I've been searching for more underground maps and tokens. The artpack looks like exactly what I've been needing... except that recently the characters in my campaign discovered a legendary land called "The Surface" and are now trapped there, cut off from all underground lands and creatures. Maybe this artpack should inspire me to let them find a way home! Hopefully you'll enjoy this artpack. I tried to make it somewhat varied. Asgardnorth.net & Asgardnorth.com , 2 sources for your Fantasy Needs. Com for freebies, Net for commercial items. Stop by and take a look. 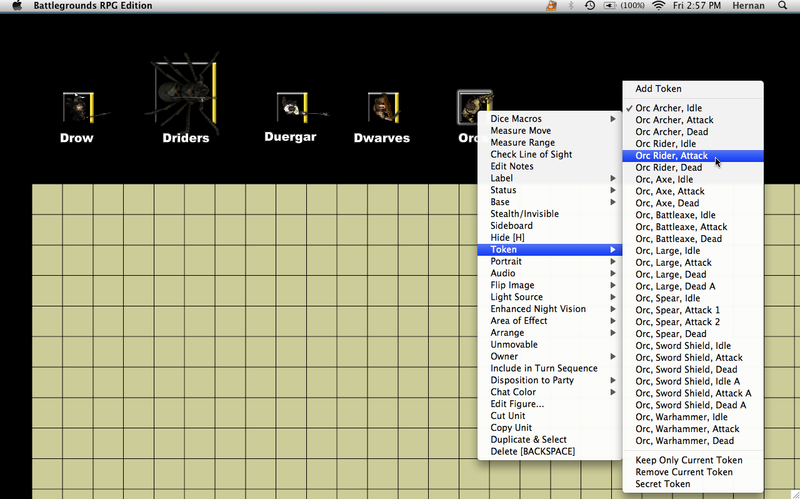 Look at the bright side: 40% of the artpack (Dwarves and Orcs) is suitable for the surface world. BTW, I think my preview pics came out a bit dark this time (I must have used the wrong color palette, or something). The tokens are nowhere near this dark in BRPG. That looks really nice; the bases for the tokens seem transparent? 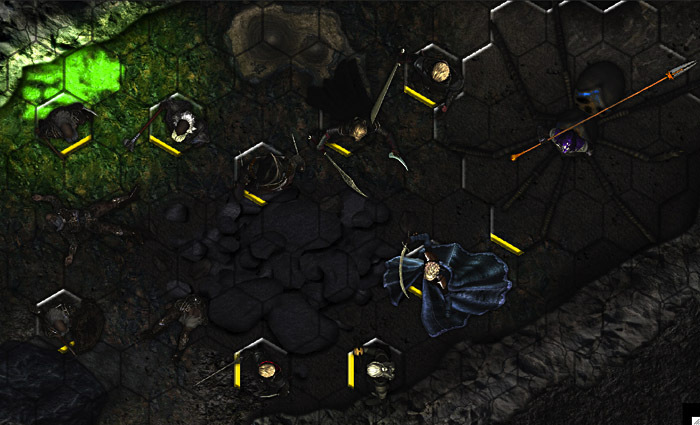 The bases are a customizable feature in BRPG. You can set them to different colors, chose to use either square bases or hex bases, or turn the bases off altogether. In other words, the bases are not an integral part of the token artwork in this or any other artpack. I tend to favor transparent bases, since they let you see the terrain that the figure is standing on, which is often a factor when determining combat modifiers and the like. I noticed that there was a distinct lack of "Reviews" of well everything, so I will take a crack at it. I will review art packs in alphabetical order but if anyone wants a review on something please let me know. Armies of the deep, is well worth your money. 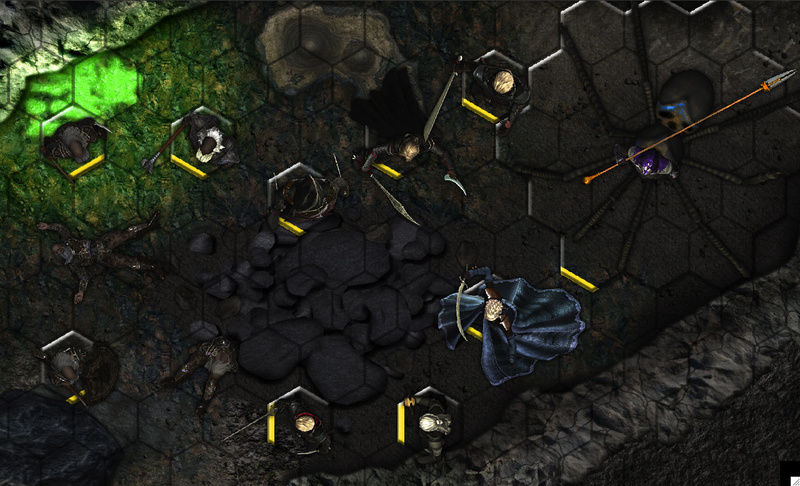 It is packed with 5 races like Drow, Driders, Duegar, Dwarves, and Orcs. Each figure is richly detailed. Here is a breakdown of what you get. The Drow comes with 8 distinctly different figures. The Drow Priestess comes in 2 colors, while all have the 3 poses of idle, attack and dead. The Driders comes with one figure with a idle weapon varation of a polearm. The figure also has the attack and dead poses. The Duegar comes with 4 figures and the 3 poses of idle, attack and dead. The Dwarves come with 7 figures, the 3 poses (except Dwarf with Battle Axe has no dead pose) and a version 'A' of each figure. The dwarven birdiche come with two idle poses. 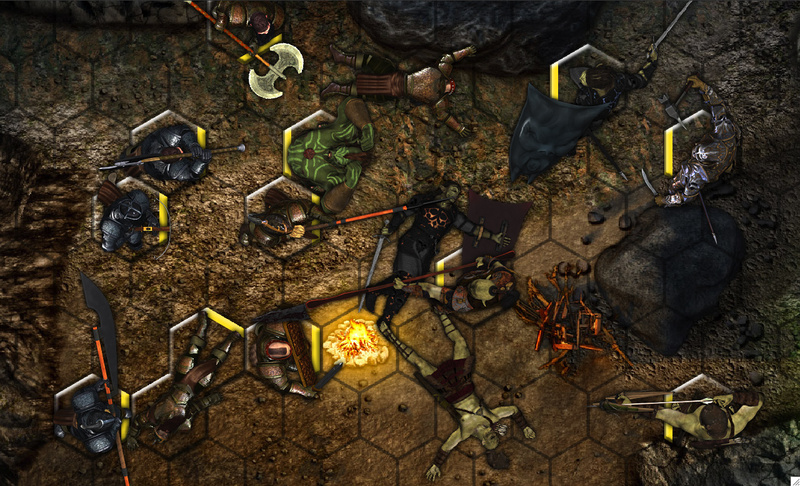 The Orcs come with 7 figures, the 3 poses of idle, attack and dead. A few variations of attack poses and some A version are also mixed in. There's a nice mix of common classes and weapons for each race. There is some spellcasters, missle weapon figures, but most are melee warrior based figures. It is an army set after all. Each token keeps detail even at 200%. Only minor pixilation occurs at 400% zoom (figure 200% + zoom 200%) I have also used all figures in my games with no glitches. I put together this Unit Palette (see attachment) to add value to this BRPG artpack. It is intended to make the process of finding and placing specific figures on the map significantly faster and easier than with the standard method of browsing artpack content. BRPG v1.8b or higher is recommended in order to use this Unit Palette to its full potential. Installation instructions are included in the zip file. Only the GM needs to install these files. Players do not need to download or install the Unit Palette, but they will of course need to download and install whichever artpack/s the GM plans to use in his/her game sessions. Load one of the included Encounter files. This will automatically load the relevant Media Asset Bundle (which contains the rendered text labels). The Encounter will present you with a blank map canvas, with the Unit Palette located just above the map. Simply copy a unit from the palette that you wish to place on the map, paste it to the desired spot on the map, and then use the token-swapping hotkeys to select the exact token you wish to use. When you are satisfied with your token selection, select the "Keep Only Current Token" command from the unit's contextual popup menu. The Unit Palette also comes in Deployment format, so that you can easily import the Unit Palette into any existing Encounter to continue fleshing it out. Regardless of whether you use the Encounter or the Deployment, when you no longer need the Unit Palette on the map window (e.g., if you are finished creating your layout), simply select the entire Unit Palette with the selection marquee and delete it from your Encounter.